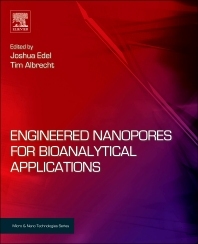 Engineered Nanopores for Bioanalytical Applications is the first book to focus primarily on practical analytical applications of nanopore development. These nanoscale analytical techniques have exciting potential because they can be used in applications such as DNA sequencing, DNA fragment sizing, DNA/protein binding, and protein/protein binding. This book provides a solid professional reference on nanopores for readers in academia, industry and engineering and biomedical fields. In addition, the book describes the instrumentation, fabrication, and experimental methods necessary to carry out nanopore-based experiments for developing new devices. Biomedical Engineering; Applied research scientists / engineers involved in the applied R&D areas of bio micro-nanofluidics, genetic engineering, Micro/nanofabrication, BioNEMS, bionanomaterials; Pharmaceuticals Engineers and Biotechnology Industry Scientists working on drug discovery, drug delivery methods, safety and drug screening; Biomedical laboratory researchers working on new methods for Tissue Engineering, Stem Cells, and Regenerative Medicine technologies; BioNEMS , biosensors, and micro- nanofluidics industries.